Book Review- "God Bless my Family"
The watercolor illustrations are sure to draw you into this board book. 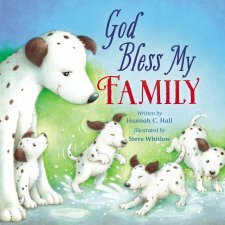 "God Bless my Family" is an adorable board book best suited for preschool ages, however, my older children loved it as well. My two kids loved the puppies in the story. This board book is great to read as a family because the whole book teaches the value of family. This book will remind your children to be thankful and grateful for the family we each have. As you page through this board book you will have a different dog on each page. Also, you will discuss a different family member on each page, from mom and dad to grandparents, aunts, and cousins. It sure is a book that will make you happy you have your family. I also really like the title as you read it you are declaring and praying "God Bless my Family." I know in my heart it is my prayer for all of my family to know Him more and walk in his ways filled with His blessings. Thank you Book Look program for sending me this book for free in exchange for an honest review. I was not paid for this review and all opinions expressed are 100% my own.